Prevent Burn Injury While Grilling This Summer | Phoenix Personal Injury Law Blog - Breyer Law Offices, P.C. As Arizona personal injury attorneys, we want to make sure that get-togethers remain fun and everyone stays safe without experiencing any injuries. Burn injuries are one of the most common types of injury a person can suffer during BBQs. Burn injuries can be serious and even deadly, as well as result in a lifetime of pain and disfigurement. Here are some tips to help you and your loved ones avoid injuries while at a fun gathering of friends and family. Wear protective gear around the grill. It is important to protect yourself from the heat of a grill. Wearing an apron as well as using an oven mitt or BBQ mitt is important and can protect you from serious burn injury. Make sure to also keep the flames turned down and watch for grease flare-ups. Don’t lean into the grill to check the food. Instead, keep your face away from the flame at all times. Keep children away from the grill. 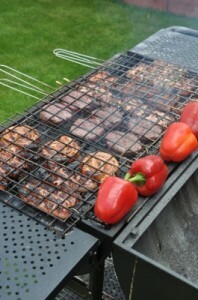 The grill should be set away from the main gathering area, especially where children are playing. Children should be supervised at all times and should be reminded to stay away from the grill. Grills can be hot to the touch and grease can drip onto children. They are not safe to play around. Make sure the grill is on flat, stable ground. Make sure to avoid having the grill tip over and fall. Place it on a flat, stable surface and make sure it doesn’t rock or wiggle in any way. It should stand unsupported and not be able to roll or tip without strong force. If it has wheels, lock them or block them with rocks or bricks so it cannot roll away. Do not turn the grill on until it is completely secure. Watch for pot handles and utensils. Make sure there aren’t any pot handles sticking out that could get caught on someone’s clothing and accidentally knocked off the grill. This will also ensure children can’t reach up and grab a hot pot and pull it on top of themselves. Keep all utensils out of reach as well, particularly hot and sharp utensils. Let the food cool. Don’t serve food until it cools in order to avoid burn injuries. This is especially important for children. Have a fire extinguisher handy. Make sure to have a fire extinguisher handy in case of a fire or flare-up that jumps out of the grill. Avoid grilling on windy days so the flame can’t be carried out of the grill. If you or your loved one has suffered a burn injury due to the negligence of another, contact The Husband and Wife Law Team today to find out whether you have a viable personal injury claim. Are Sparklers and Fireworks Safe in Arizona? Avoid Grill Injuries During the Holidays!